~ Hi, it’s Stephanie here with a new cookbook review AND giveaway!! 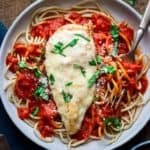 I’m here today to tell you this Healthy Chicken Parmesan is a keeper! It’s ready in 30 minutes, making it a perfect weeknight dinner. Plus, it’s a healthier version of the traditional recipe and even has a gluten-free option. My family went nuts over it. This is called a recipe trifecta. And that makes it a keeper in my book! Disclosure: I received a copy of this book at no charge to me from the publisher, Fair Winds Press, in return for my honest review. I was not financially compensated for this post. The opinions are completely my own based on my experience. 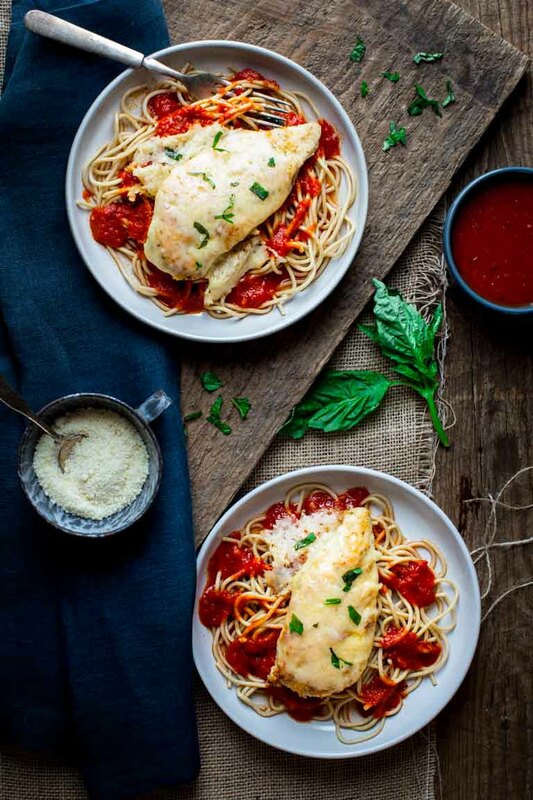 Chicken Parmesan is a family favorite in my house. It’s usually something my husband makes on the weekend. It’s absolutely delicious, but not necessarily the healthiest thing on the planet. Think: tons of bread crumbs, tons of butter, tons of cheese…. oh so good! 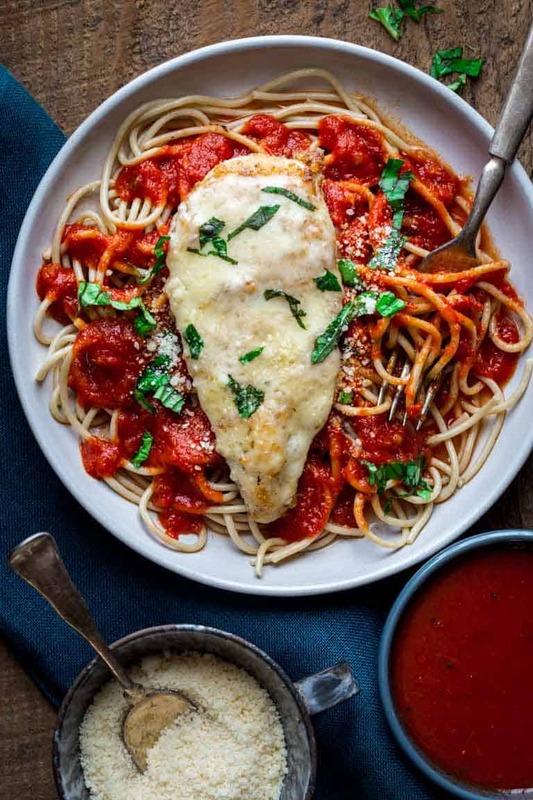 So when Kelly Pfeiffer’s new cookbook, Superfood Weeknight Meals, landed on my desk her healthy chicken parmesan recipe jumped out to me immediately. She’s the author of the awesome blog nosh and nourish. All of her recipes feature one or more of her 10 selected superfoods and all the recipes are ready in under 30 minutes. You will be amazed by what you can accomplish in 30 minutes, so enter to win this awesome cookbook below! This is Kelly’s second cookbook. Her first is Superfoods at Every Meal and is also based around 10 superfoods. And no, we’re not talking about super weird, crazy hard to find foods. Her superfoods of choice are everyday ingredients that we all know and love, but don’t always make sure to eat everyday. Foods like avocado, lentils, sweet potatoes, eggs, nuts, spinach, quinoa. See, not scary at all! There is something for everyone in this book. If chicken is your jam, her Slow Cooker Pineapple-Chicken Tacos look amazing! And it makes enough to have leftovers for lunch the next day. I can’t wait to try her Spiced Beef & Hummus Pitas. Just thinking about the smell of the cinnamon, cumin and chili powder spiced beef as it cooks has me drooling. Kelly also has many meatless recipes that all look so scrumptious and are very creative, but not in a fussy time-consuming way. Like her Super Greens Mac & Cheese Cups stuffed with spinach, basil, artichoke hearts and of course cheese. Not only are they super cute, but they would be perfect for school lunches or an afternoon snack. I love versatile recipes! As you can probably tell I love food. I love shopping for food. I love cooking food. Oh, and big shocker… I love eating food! And even with all of this food-love going on, I still find myself scrambling most weeknights to get a healthy and delicious dinner on the table for my family. I can’t even imagine what it’s like for someone who doesn’t necessarily feel all warm and fuzzy as they’re running willy nilly around a grocery store on their way home from a long day at work!! 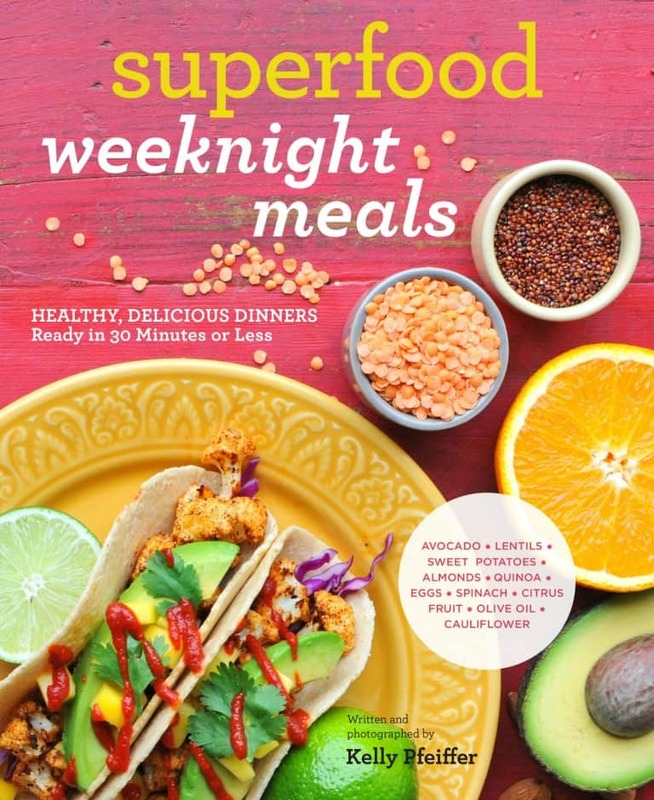 Kelly’s new cookbook is a life-saver! It is chocked full of healthy, fast and delicious recipes that feature easy to find ingredients. So stop stressing about what’s for dinner and get a copy of this book right now!! 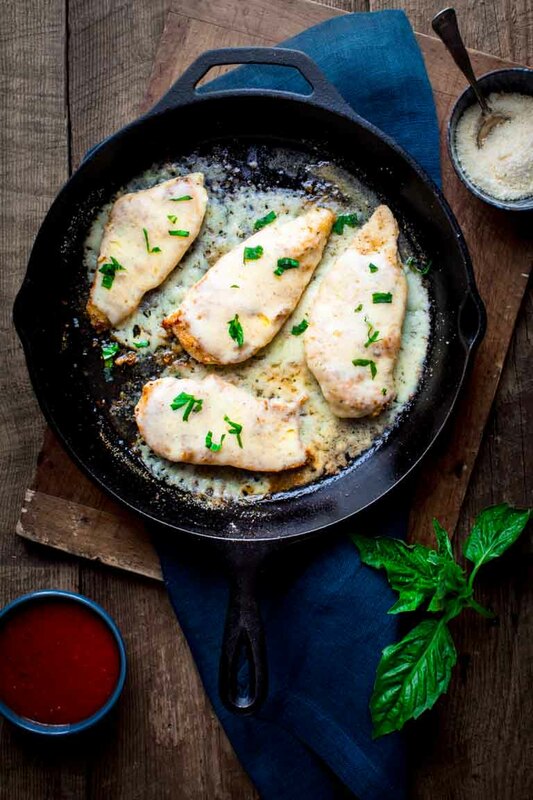 This Healthy Chicken Parmesan is a keeper! It’s ready in 30 minutes and tastes like the classic dish even though it’s much healthier. In a small bowl, combine the almond flour, basil, oregano, and sea salt. Meanwhile, dip each piece of chicken in the spiced flour, coating evenly and completely. Put the coated chicken in the hot oil, and let it sear and cook on one side for 4 minutes. Then, flip, top with the provolone cheese and sprinkle on the Parmesan cheese. Cover and cook for 4 minutes more, or until the cheese is melted completely. Assemble your bowls: spaghetti or zucchini noodles if using, sauce, and chicken. My favorite superfood is blueberry. It’s hard for me to choose a favorite, but I do love blueberries!! Me too! I love to put them in my overnight oatmeal! My favorite superfood has to be blueberries. This cookbook sounds great — thanks for the giveaway opportunity! It is an awesome cookbook!! My favorite super food is blueberries! Thanks! Just now going beyond dipping my toe into conscience eating. That’s awesome!! You would love Kelly’s cookbook! Avocado with sweet potatoes as a close second! My favorite superfood is apples! Agreed! We love our apples here in VT! This healthy recipe is definitely my family favorite. We usually make it for Saturday lunch, the kids always ask for more. 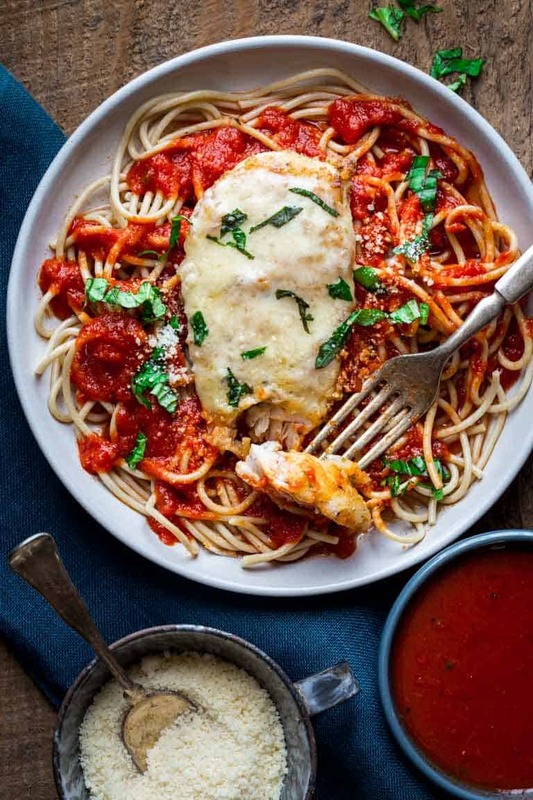 Seriously, who doesn’t love chicken parmesan tho. Thanks for sharing. Plus my favorite food is Apple! Yum yum yum! Love the simplicity and great flavor of this recipe.